- The First trial is rather simple, Just keep pressing circle.Grabbing the handes and breaking them in half. 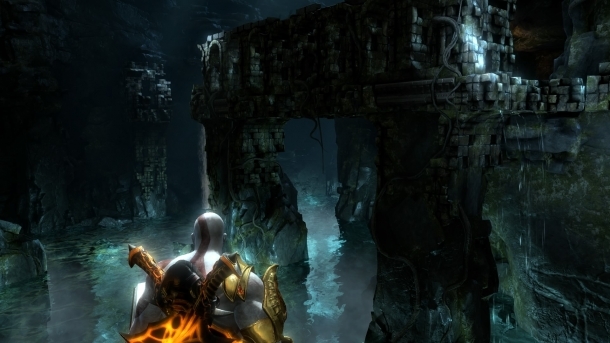 As fear Kratos,and possibly even Kratos. These are one shot killers. Alsofor the Olympic Citizens, get them before they turn into monsters.Just keep hitting them with light attacks. - Once the Minotaurs come, focus attacks on them. The real problemis phase 3, or trial number 3, which is DESTROY EVERYTHING ! - Good thing about this part is that if you do die, you will startat the last trial you were previously on. So basically each trialcompletion will have a checkpoint. Even on Chaos mode. - Trial 3 could be the hardest and probably is. Trick it canbe done rather easily though. - There will be Gargoyles or something similar, that will crashinto the ground and explode. It has radius damage and can one shotkill Fear kratos. The best tactic is to take out the Gorgon. Ripher head off OR Block her Stone Gaze attack. With the Golden fleecethis should reflect and hit all enemies in a radius. Hopefully withsome luck you can get the nasty gargoyles. You may possibly want tosave this move for the minotaurs as well. Either way the gargoylesare the most dangerous. -We will now be dealing with not one but TWO cerberus at the doorright before Hades Palace. - This can be hard because they are fast moving and were dealing withtwo at a time. The Bow of apollo is our friend here, and i suggest youlevel it up to max level or level 2. -At First Use your army of sparta, one shot should bring up promptson BOTH Cerberus if you timed it right and or aimed correctly. Youshould also be able to pull off both prompts, ripping off bothcerberus heads, on each serparte cerberus. rinse and repeat and theyshould both only have one head left. - Immediatley use army of sparta again, and if your out of magicthen quickly use the blades on one cerberus. Follow the prompts andget rid of one of them for good. - Now play it safe on the final one, moving away and everytime youhave enough room, volley out some apollo arrows on the cerberus.It should bring up the final prompt shortly. Then take it down. - Finally once inside, there will be another battle scene. Use grabs mainly kicking baby cerberus into the undead warriors. Do NOT worryabout the chest, grabbing them may cause you to die. - WE have reached another check point, and will have some exploringand puzzle solving to do next. I am expecting you have already beatenthe game, which is why I am only covering, neccessary battles. So saverelax and get ready for one of the best Boss fights in gaming history. * This battle was written for Kratos regular costume.tactics will work with Fear Kratos as well. It ismuch easier as Fear kratos, because of the damage increase. 1. After The Stomp Attack, Roll away and Fire off a barrage of Arrows.2. After Block or parry on Claws, Be quick with Light attacfks. * At the Start of phase 2, Hades will always do this, when he landsbe aware and jump over the shock waves. - Left and right claw attacks, can still be dodged and parried inphase 2. - Hades will now also swing the claws, low and high. He will dothis up to 5x times. Jump accordingly or stay low, accordingly. - After 4,5x claw swipes, immediatley start firing volleys of arrowswith no fire enhancement. Hades is immune to fire. Rinse and repeatthis tactic for the entire phase. - Always try staying in the middle of the battle field the entiretime. Follow the prompts and get ready for the hands and hades organ. - Use light attacks on the organ, they are the most accurate, andeffective. Once it's down you will begin phase 3. - This is the most difficult phase of them all. - Hades will start out by casting chains everywhere, except for oneor two areas. Find those areas and quickly go to them to take nodamage. - Hades uses just about all of his attacks from phase 1 and phase 2.You should definitley, have a fully powered blade of olympus at thispoint in the game. I suggest using it and using it hard. Hades will do his ground slam to start the phase. Jump over it.He will now cast souls and use a lashing claw attack. Now it istime to finally use our magic. Get in close and use Army of sparta.Use it either until the prompt or it empties completly. - For the lash whip, it is hard to avoid with a roll, butrolling away is the only way. He will lash whip quickly,there will be very little time to fire arrows, it takespractice and you MUST be fast. - When he summons his skulls, he leaves himself open for a bit.Use that to your advantage, the skulls are nearly impossible tododge, yet they do little damage, even quadrupled on fear kratosmode. - Follow the prompts and take out the organ, with light attacks again. Beware for hades chanin montage next, find the open areaand go to it like at the end of phase 2. Hades will have the chains come out of the ground, theywill follow kratos around, you must keep moving to avoid.It is possible to fire arrows and move away from them, atthe same time, although dangerous. - These are like the skulls, except even harder to dodge, even more powerful as well. They are unblockable, try toavoid at least one of them and then fire off arrows. - This phase is the final until a much needed checkpoint.follow the prompts as Hades energy bar is much lower inthis phase then it was in phase 4. - Much easier because now we have a check point.not to mention all it is IS tug of war. Keep movingbackwards and then use quick lashes. Eventually the Promptwill come up. Follow it into phase 7. - We now have the claws of hades, and we MUST use themfor this phase. There are grapple points, that we can useto our advantage to get in back of hades. Use them wheneverpossible. And quickly use heavy attacks on his back. - It may take a few tries, but this Final phase has acheckpoint as well. Which makes this much easier thenit seems.
! Congratulations ! ! You have Earned the Wrath of Hades Trophy !! View the Video on Gamefaqs.com! Codebreak1337 Youtube.com! Americanhardcoregames.com Full Digital guide with originalfan art !